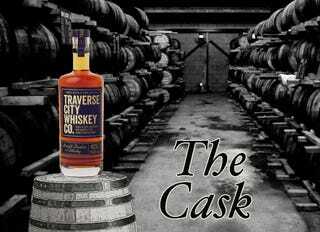 The Cask: Traverse City Whiskey Co.
Today we continue Michigan Whiskey Month with Traverse City Whiskey Co.’s Straight Bourbon Whiskey. Last week I tried what has become my favorite bourbon - New Holland Beer Barrel Bourbon. So we continued our loop around the lower peninsula of Michigan by heading up to Traverse City. I unfortunately have to report that this was....disappointing. Traverse City Whiskey Co. is clearly selling this stuff simply because of the brand name of Traverse City. I don’t really have a ton to say here, the flavor just wasn’t there for me. I thought it was just the fond memories of my new favorite Bourbon from New Holland that was interfering with my flavor expectations, so I tried some W.L. Weller for around 10 bucks less a bottle and even the Weller was better. Maybe I should have got the Cherry flavored one they sell, Traverse City, MI is known as the Cherry Capital of the World after all. I just really wanted to taste the whiskey itself, not the cherries. A 3? After a 1 last week? Yeah, there’s ups and downs when you’re trying new stuff. Unfortunately this week was a down...a big down. I ALMOST made this a 4. I might be being too nice to it, in a tiny bit of defense for it, my wife actually didn’t think it was that bad. I thought is was kind of sour flavored instead of the sweetness I got from the New Holland. At the end of the day I would not recommend it. If you want a Bourbon that is made in Michigan, the answer is still New Holland Beer Barrel Bourbon.